Jeremy and I usually spend our weekends working because that’s when all of our favorite places tend to be the busiest. But after a long day of shooting (for me) and editing a scientific paper (Jeremy), we needed to get out for a break. 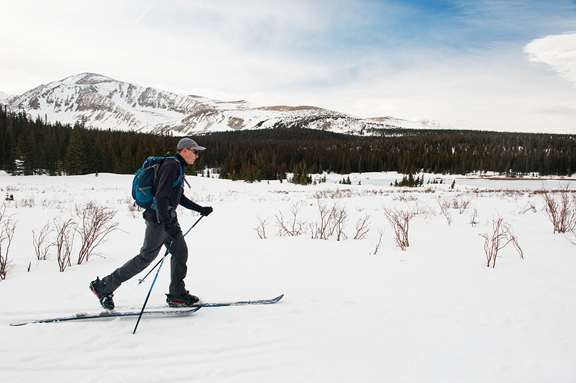 My idea of a break is exercise in the great outdoors. And they really were great that evening, touting some of the finest spring conditions I’ve enjoyed in a long while. 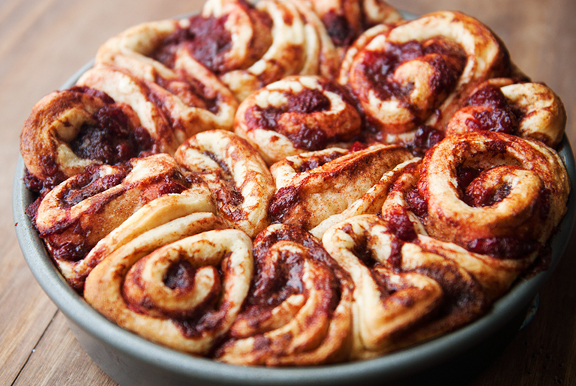 The thought of warm cinnamon rolls fresh out of the oven on a snowy day is attractive even for a savory addict like myself. But I had a bunch of undesignated strawberries in the refrigerator that needed to be eaten, so… they got tossed into the cinnamon rolls as well. What’s not to love? While the dough was rising, I processed the berries: washed, hulled, chopped. I think a medium dice (1/2-inch cube) is a good size for the berries because when you cook them down with sugar, you still have identifiable chunks of strawberry instead of a syrup. They are also small enough that it’s easy to spread them over the dough. 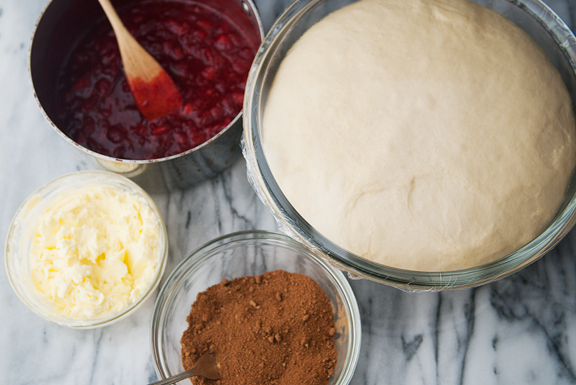 Before you tackle the dough, it’s good to have the rest of the fillings ready. Beat or mash the butter so that it is smooth and easy to spread. Combine the brown sugar and the spices. And you’ll need to pick a large work surface. It can be a large pastry board or a table or counter top. Something long enough to accommodate 2 feet of dough and then some. If you don’t have space long enough for that, consider working in halves (using half the dough and half the fillings). 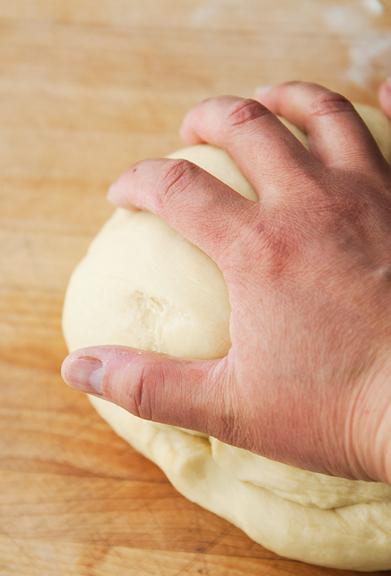 Be sure to leave yourself a little 1/2-inch margin on the dough with no filling along a long edge. It helps to seal the roll up. Spreading the butter and sprinkling the sugar-spice mix is easy enough. When I first distributed little blobs of the strawberry filling around the dough, I worried that I wouldn’t have enough. It beaded up and was a little difficult to spread. But give it a few minutes and its surface tension breaks down and the whole thing begins to spread more easily. Based on my experience, it’s okay if you run out or the strawberry filling gets thin toward the edge with the margin. 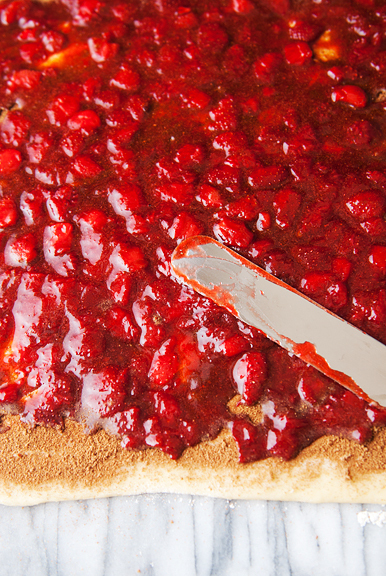 When you roll the pastry up, you will have an excess of strawberry filling piling along the rolling edge. It gets MESSY. I mean, the whole thing looked like murder on a pastry board. But it smelled insanely good! Have your buttered baking pans at the ready before you start slicing the roll. You can bake your rolls in round pans or a rectangular baking pan or any weird shape that strikes your fancy – totally up to you. When you cut the slices, they will lose some of their guts. Do not fret. Stuff strawberries and filling back in between the spirals and then set them in the baking pan. If something else falls out, just tuck it back in to the roll in the pan. It all works out. The rolls get a second rise of 45 minutes or so until they have doubled in size. 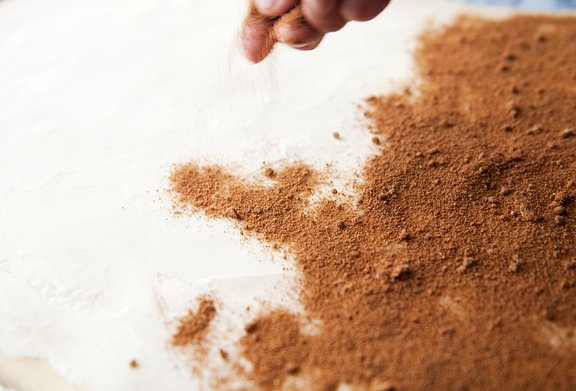 While those are filling in the nooks and crannies, you can make the cream cheese frosting. While a simple icing sugar and pick-your-liquid (milk, water) works with cinnamon rolls, I can’t sing enough praises for cream cheese frosting. It’s the best. You know what’s better than best? 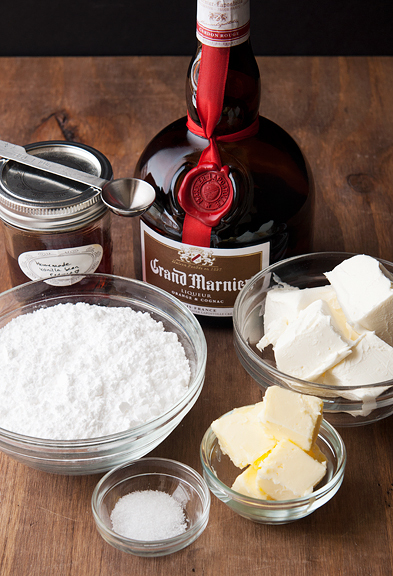 GRAND MARNIER CREAM CHEESE FROSTING. Aw, hell yeah. Grand Marnier is optional, especially if you can’t do the booze thing. It just makes it taste so very very wonderful. And you can adjust the amount so that it’s a lighter, subtle flavoring. I wanted mine on the stronger side – sort of a kick in the face, but in the very best way possible. Be sure to frost the rolls when they are still hot. You can frost them directly in the baking pan or you can do a double inversion (invert pan to plate, then plate to serving plate) and frost them on the serving plate. When I finished shooting the recipe, I ran about cleaning up my studio. 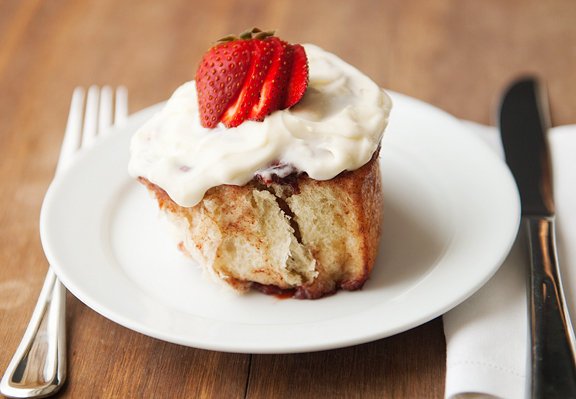 If you make these strawberry cinnamon rolls, everything you touch will become sticky. There will be sticky in your hair, on your face, on the backs of your hands, on your pants, on the dog, everywhere. I grabbed the hero plate and set it on Jeremy’s desk while he was working. “Eat this,” and I dashed away to unload a pile of dirty dishes in the sink. When I turned around, Jeremy was standing in the kitchen, his eyes wide. “This! This is SO GOOD!” He was hooked. I didn’t even expect him to like the rolls at all, but he was completely gaga for them. And the frosting? Jeremy is not friends with cream cheese, but I suppose it’s nothing a little (or a lot of) Grand Marnier can’t mediate. I’m quite happy with the rolls, except for one small detail. If your rolls are covered in the strawberry-brown sugar-spice goo, then it’s really difficult to gauge when the rolls are “golden”. Mine were undercooked in the center of the pans, so perhaps a toothpick test in the center might be helpful. In any case, these rolls are absolutely worth the mess. 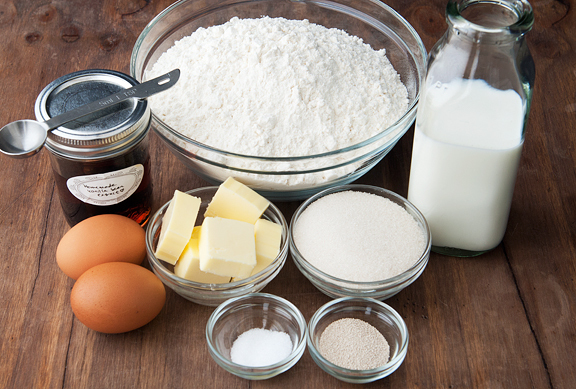 Make the dough: Heat the milk over low heat until it measures between 100 and 110°F. 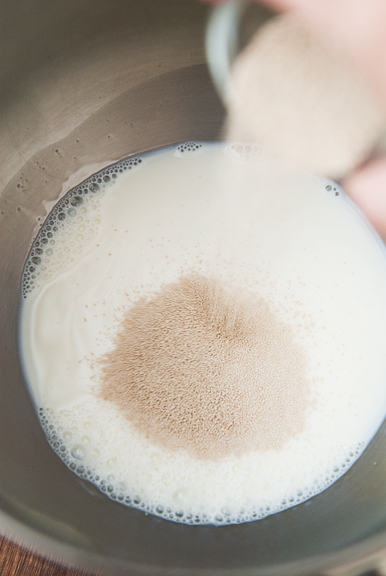 Pour the milk into the bowl of a stand mixer and sprinkle the yeast of the milk. Let sit for 5 minutes. 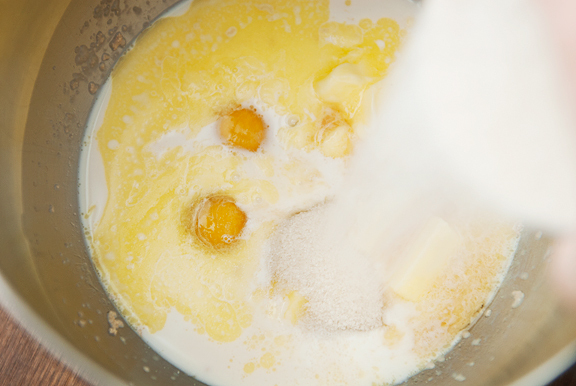 Add the sugar, butter, eggs, vanilla extract, and salt to the milk. Beat with a whisk or paddle attachment until incorporated. Switch to paddle attachment if not already using, and stir in 1 cup of flour at a time until the dough is thick. Switch to a dough hook or turn the dough out onto a lightly floured work surface. 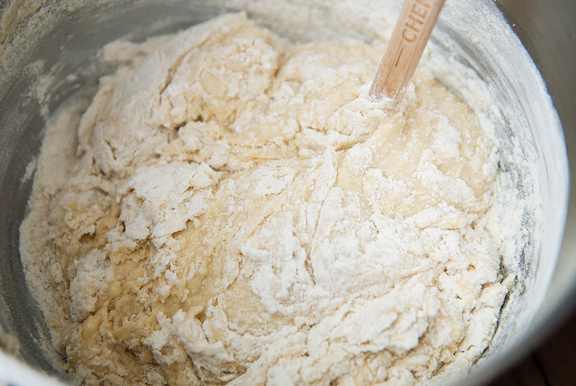 Knead the dough until it becomes smooth (5 minutes with the dough hook or 7 minutes by hand). 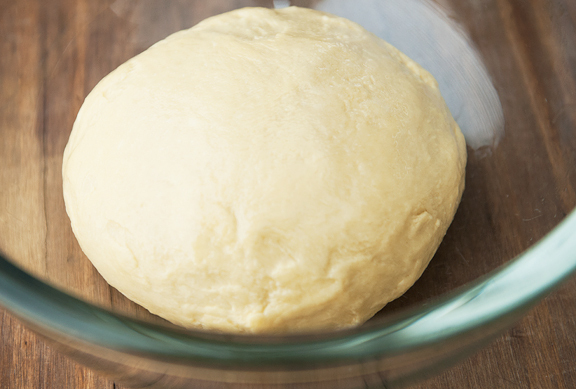 Lightly grease a large bowl with unflavored oil (vegetable oil, canola oil), and place the dough in the bowl. 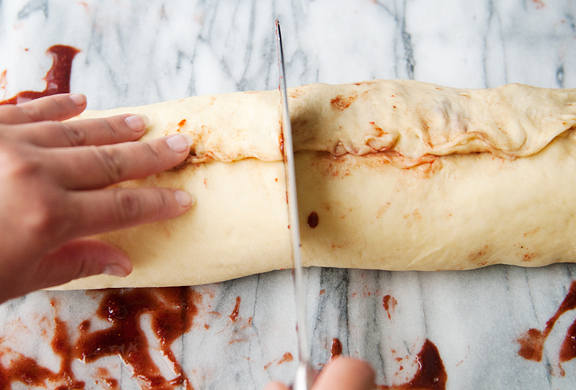 Flip the dough to coat the entire thing with oil. Cover the bowl tightly with plastic wrap and set in a warm location to rise for 2 hours or until the dough has doubled in size. 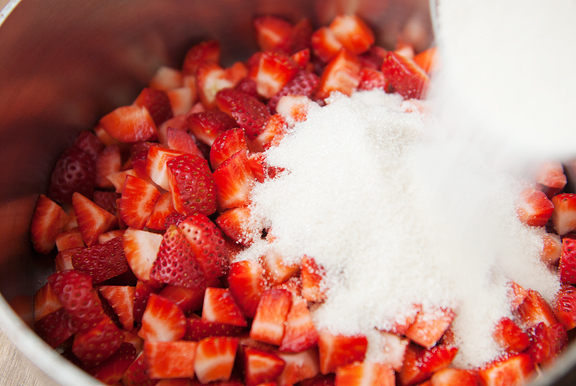 Make the strawberry filling: Place the diced strawberries and the 1/2 cup of granulated sugar in a medium saucepan over high heat. Stir to mix the sugar with the fruit. 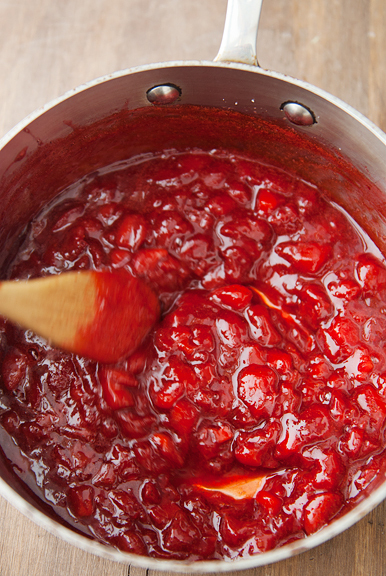 When the strawberries begin to boil, reduce the heat so the strawberries are simmering. Simmer for 30 minutes. It should have a consistency halfway between a syrup and jam. Turn off the heat and let cool. 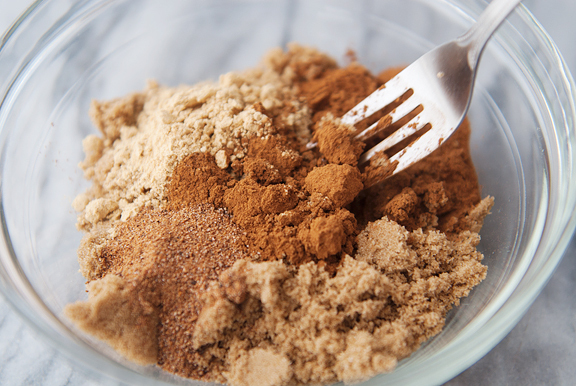 Mix the brown sugar, cinnamon, nutmeg, and ground ginger together in a medium bowl. Assemble the rolls: Butter two 9×3 inch round pans (or a 9×13 inch rectangular baking pan). When the dough has risen to double its size, remove the dough from the bowl and set on a lightly-floured large work surface. Roll the dough out to a 14×24 inch rectangle (or if you have limited space, cut the dough into two equal halves and make a 14×12 inch rectangle with the first piece of dough, then proceed as directed but with only half the filling). Spread the softened cup of butter over the dough, leaving a small margin of a half inch at one of the long edges (so that you can seal the dough when you roll it up). 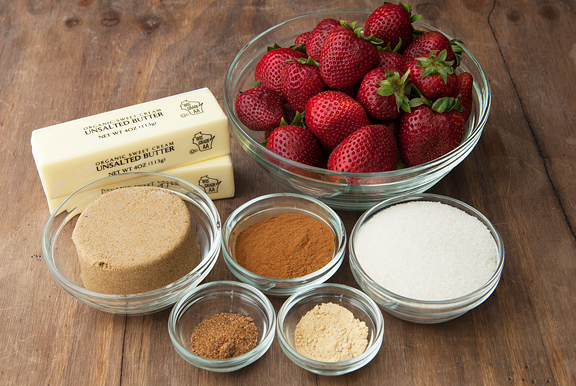 Sprinkle the brown sugar spice mixture evenly over the butter. Place little dollops of strawberry filling evenly over the spices. It will bead and look like there won’t be enough to spread, but don’t worry – it will be fine. After a minute, start to gently spread the strawberry filling out with an icing spatula tapering off toward the margin end because it will pile up as you roll it and you’ll have tons of strawberry at the end. 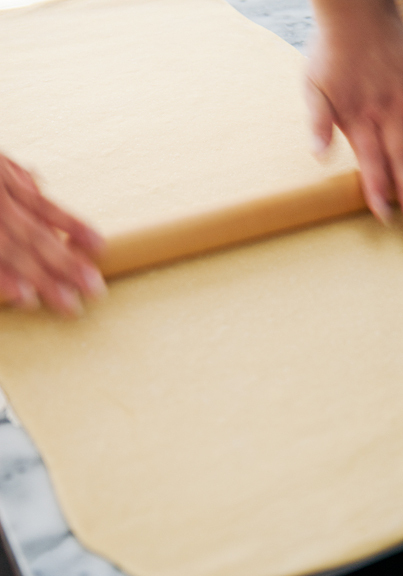 Starting at the long edge that does not have a half-inch margin, begin to roll the dough up. Because the piece is so long, you will need to roll a turn in the middle, then move to the left and roll and turn, then move to the right and roll a turn. Continue to do so until the entire thing is rolled up. Pinch the margin edge to the roll to seal it. 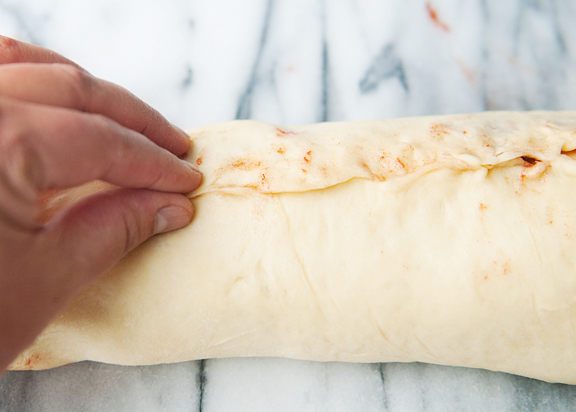 It’s okay if it’s messy or doesn’t seal all the way – we’re just trying to keep it rolled up. Take a sharp knife and cut the roll into 24 equal slices. 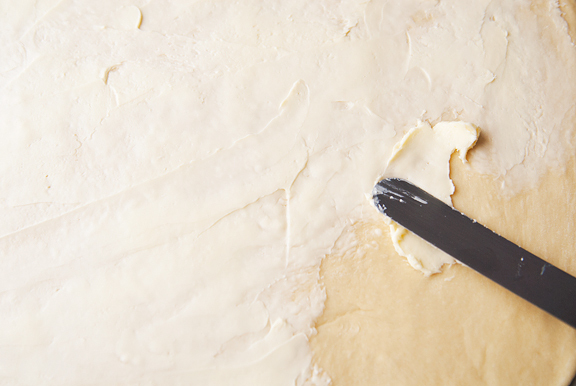 If you cut the dough into two halves, then cut your roll into 12 pieces and do it all over again with the second half. Arrange the slices, cut side up in the baking pan(s). 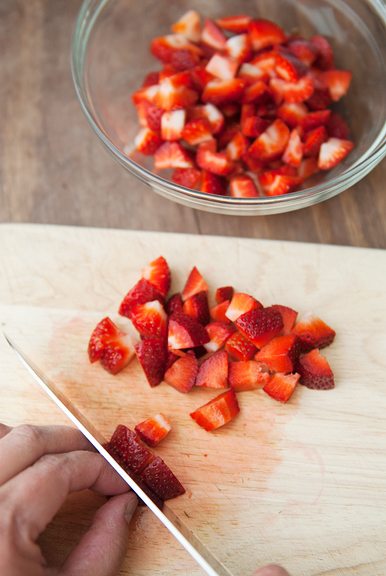 Tuck any stray strawberries (there will be plenty) into the layers of the slices. Cover the pan(s) and let rise in a warm place for about 45 minutes or until the rolls have doubled in size. 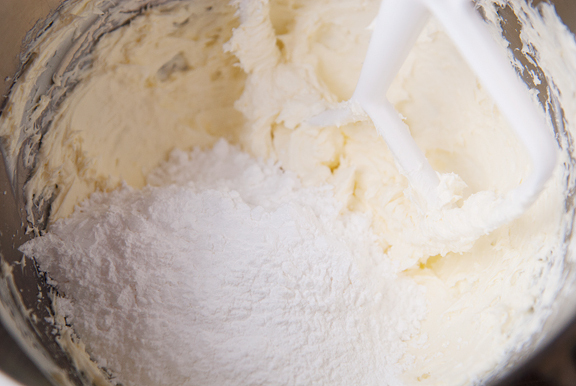 Make the icing: Beat the cream cheese and butter together. 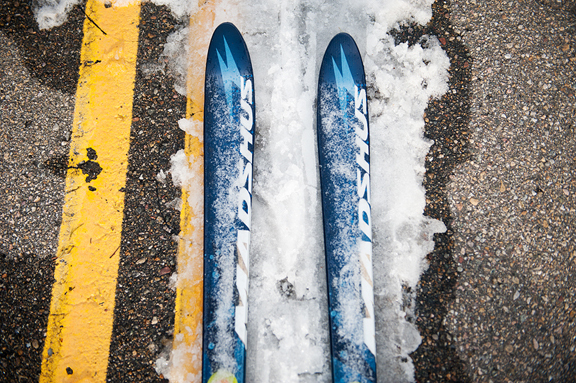 Beat in the powdered sugar. Add the vanilla and salt and beat until incorporated. 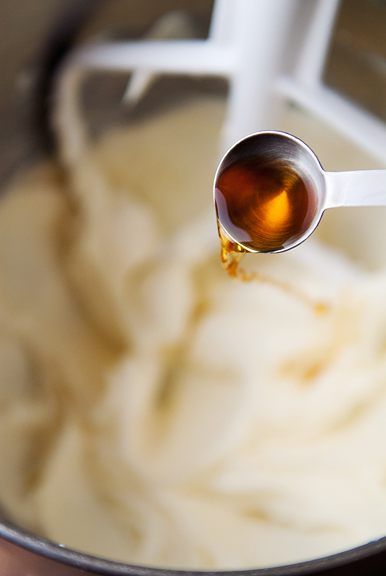 Add the Grand Marnier a tablespoon at a time, beating after each addition until blended. Preheat the oven to 350°F. Bake the rolls for 25-35 minutes or until golden. You might want to place the pans on a baking sheet or foil to catch buttery drips during baking. Remove from oven. You can frost the rolls in the pan or invert a plate that is larger than the pan on top of the rolls and flip the pan and plate together so that the plate is on the bottom. Gently lift the pan off the plate and give it a slight jiggle to release the rolls. From here you can invert the rolls onto a serving plate or leave them upside down. Either way, they should be frosted and served warm. Makes 24 rolls. I am beyond ready for strawberry season to arrive, and these only make me more impatient! 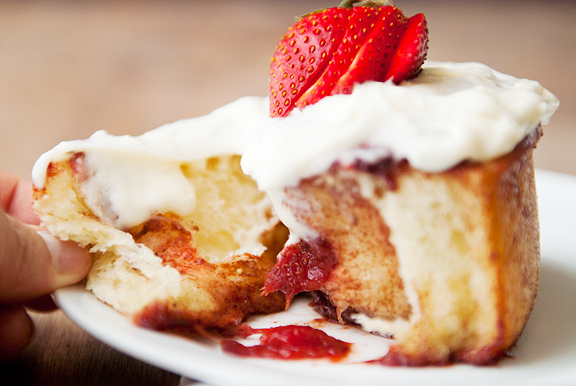 The combination of cinnamon, grand marnier, and strawberries sounds heavenly. Yum. Yessss please!! 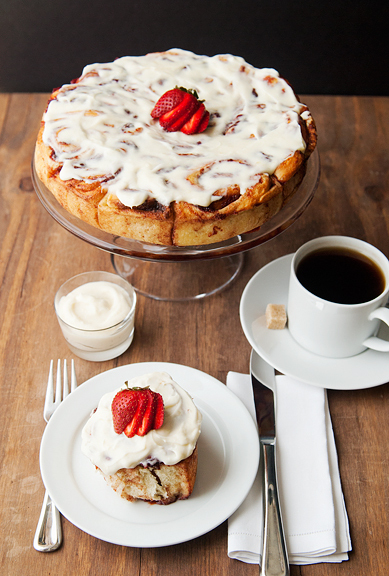 I love the idea of a fruity cinnamon roll! I clearly need to do some creativity exercises. I would never have thought to do this, but…YUM! I’m not sure which part excites me the most (I lie…it’s the Grand Marnier cream cheese frosting!). I’m convinced you’re wonder woman: working, skiing, and making (what seems like) super complex awesome recipes on the regular. After a day at work I always just want to go home and lounge around. These look truly fantastic. Oh dear. I think I just drooled on myself after looking at your photos. Do you have a spare napkin? You have outdone yourself this time Jen. I haven’t left a comment for a long time, but I routinely follow your posts. 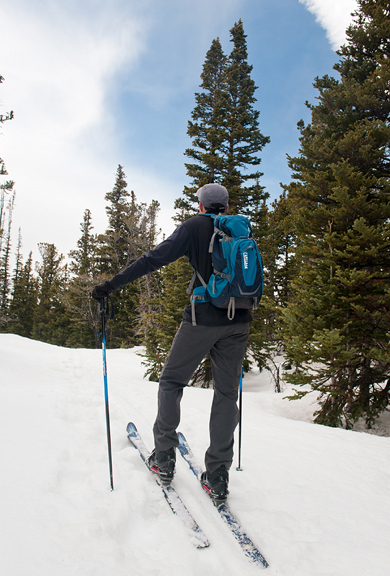 I love your new place in Crested Butte! Can you freeze some? I’d love to have a piece with my morning coffee when I come to visit in June. You’re no doubt very good at cooking, but do you think twice how much sugar and fat in this recipe? my mouth is watering. this looks really good!! i just wanted to let you know that i’ve been having some trouble loading your site (and some food blogs, too) with firefox 28.0! for some reason, firefox only wants to load the images up to the copyright line. just a heads up, in case other readers might be having issues. BTW, emma, if you see this..i don’t know if this was your intention, but i am responding based on how i perceived your comment. i think people should be their own judge of what they eat. you don’t have to make recipes with “lots” of fat and sugar (even at that, this is not even near the fat/sugar levels of other recipes i’ve seen, personally) if you don’t want to, but i don’t think it’s kind to pass judgment on those who would like to indulge in simple pleasures of delicious food once in a while. Hi Jen! Two questions: 1. do you think this can be halved (I am but one person and 24 is a lot!)? 2. Is there any good pausing point in this recipe that could be done the night before or will I just be waking up very early to make these for brunch? Thanks! Rachel – it’s really wonderful. I find that guys are particularly smitten with them (go figure). Allie – this is sort of my work (only sort of, not really). I’m no wonder woman, but I am high energy! Kathryn – always wonderful to hear from you, dear. Emma – I think about it a lot because I 1) research the recipes 2) make the recipes and 3) write up the recipes. megan – oh, thanks for the heads up. I’m running Firefox 28 here and it seems to be fine. Are you on a Mac or PC? Rocky Mountain Woman – soooo good, girlfriend. Ruthie – yes, I’m certain it can be halved (because I thought of doing that too). 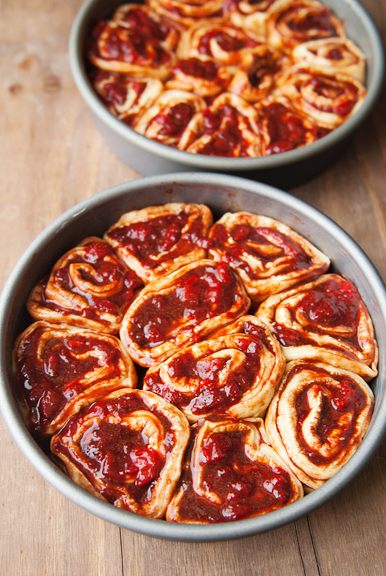 For make-ahead help, you can go to this link: http://www.thekitchn.com/how-to-freeze-cinnamon-rolls-and-bake-them-later-cooking-lessons-from-the-kitchn-198123 although I’ve never tried it myself. Good luck! i’m on a PC! I wonder what happened..it used to load your site just fine, and I don’t thiiink anything’s changed. i’m just using chrome for now. better late than never…. I made these for Easter morning and they were devoured. I halved the recipe for the sake of our waist lines….. and I especially liked the ides of SOFTENING the butter. Genius! 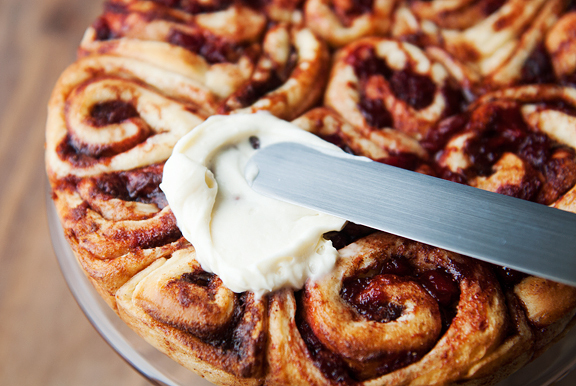 So many cini-bun recipes have you melt the butter and pour it on the dough…. talk about a mess….. I will certainly make these again, but will double the cinnamon and sugar cause we’re bad like that. nom, nom……. these were amazing! I used frozen strawberries instead, and I threw half the rolls in the freezer. Thanks for the great recipe!